Whether China and the US can avoid the clashes of the past between rising powers and existing ones has haunted many scholars worldwide. Kevin Rudd (Rudd), former Australian prime minister and a senior fellow at the Harvard Kennedy School's Belfer Center for Science and International Affairs, has proposed a "constructive realism" through which the two countries can build more trust in his newly released report US-China 21: The Future of US-China Relations Under Xi Jinping. Global Times (GT) reporter Lu Jingxian talked to Rudd on key findings and recommendations of this report. GT: Your report has pointed out a future direction that the US and China can guide the bilateral relationship to a more stable and mutually beneficial footing. How will the conclusion make impact over policymaking process in China and the US? Rudd: The honest answer to that is that I don't know. My effort was to talk to as many people as possible in Beijing and Washington for the last 12 months. They were from the military, foreign ministries and think tanks. My focus is to get my analysis right and make some practical policy recommendations. GT: You have said in the report that the Chinese economic model is probably sustainable and have dismissed the "China collapse" prediction. Where does this view come from? Rudd: My skepticism is because in the 35 years that I have studied China, several China collapse theories have been mooted. I could publish a book for each of them. But none of them has been transferred into reality. The second is on the question of the ability of the Chinese economic policy elite to do with complicate economic problems, as I said in the report. China has faced difficult economic circumstances in the past. These have been complex questions in the last five years, but the pretty sophisticated policy elite usually find their way through. I also think that theories of collapse are ultimately a little bit fashionable. I suppose it's been a product to raise analysis. China's biggest set of challenges are demography and environmental pollution. GT: The report rules out the possibility of a military clash between China and the US. However, WikiLeaks once revealed that you had advised US politicians to deal with China through military approaches. How do you clarify on it? Rudd: The diplomatic record provided by the State Department on which the WikiLeaks report is based is inaccurate. When WikiLeak first produced this, I actually consulted the Australian diplomatic record. That is not there. This is simply not the case. Every now and then, American diplomatic note-taking is not entirely accurate. And that is not an observation I hold or one that I express. GT: The China-initiated Asian Infrastructure Investment Bank (AIIB) has received a positive response. Washington initially lobbied its allies to boycott this initiative. Some observers argue that Washington wants to hold on to hegemony. What's your opinion? Rudd: Given the history of the IMF, the US tends to reform the IMF to give China more of a say. The US administration has fully supported the plan, but the problem is the US Congress. I think people need to reflect on what caused the AIIB to come into being. There is huge demand for investment in infrastructure and there is a limited supply of public finance. Additional public supply should be welcomed. GT: The report lists seven areas in which China and US should take a realist approach, such as the Taiwan question. Will these issues find solution gradually over time, or will they remain systematic contradictions in the China-US relationship? Rudd: In international relations, nothing is forever, so we need always to be mindful that things do change. But the fundamental differences of US and China opinions are well known. For the foreseeable future, we cannot foresee these differences being resolved. But we can also agree to a protocol for the management of these differences so that any one of them doesn't destroy the total relationship. There are many difficulties between China and the US which are solvable and which all our energies should have been focused on bilaterally, regionally and globally. If you start to solve some of those problems, you start to acquire political capital and diplomatic capital. Then over the time, you have an incremental increase of strategic trust. GT: One of the policy recommendations of the report is to build an Asia-Pacific Community, for example the East Asian Summit could evolve into an Asia-Pacific Community over time. From China's perspective, US willingness to participate might be doubtful, given its recent efforts to strength military ties with South Korea and Japan. How do you see this? Rudd: We should not see these things as zero-sum games. Take the Conference on Interaction and Confidence-Building in Asia (CICA). The membership of CICA, which seeks to build a common security dialogue across Asia, also includes US allies like South Korea. So there's nothing inconsistent between having a regional security institution and which also has to include those that have alliance with others. It's not healthy for the long term to have this permanent bifurcation of the region between the US and China, especially over trade. Trade has traditionally united the region in the past, not divided it. We need a pan-regional institution with wide mandate political, security, economic, which has all the countries involved. Let us have an open political, economic and security agenda. It's a bit like building strategic trust. The first step of the Asia-Pacific Community might be to elaborate the basic confidence and security-building concepts between the members. GT: How will the Sino-Japan relationship affect the overall China-US ties? From China's point of view, Washington is not always neutral in Sino-Japan disputes. 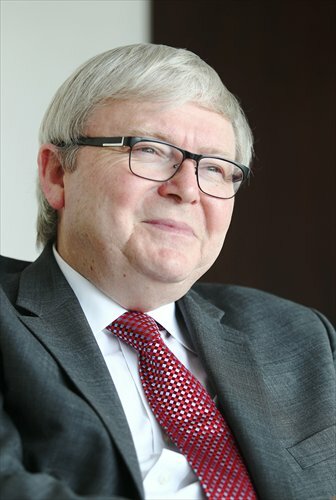 Rudd: The US makes its position very clear as the ally of Japan and in relation to the security treaty in its application to the disputed territories of the Diaoyu Islands. That's the real problem in the overall China-US relationship. Therefore, this problem needs to be managed. The encouraging news is that in 2014 China and Japan realized that the possibility of accidental conflicts was too significant to risk and both sides decided to de-escalate during the second half of last year. The Americans have been telling Japan to do that as well. It doesn't solve the problem, but puts it in a more manageable space. The key thing is now for no one to do anything else unilaterally like the Japanese did when they tried to nationalize the islands.